Some lovely shots from my friend, Joel, in Ottawa, with the Parliament buildings in the background. Tomorrow - June 2, 2010 - there will be a Best Dressed Commuter prize at the Commuter Challenge / Clean Air Day event in the Canadian capital. 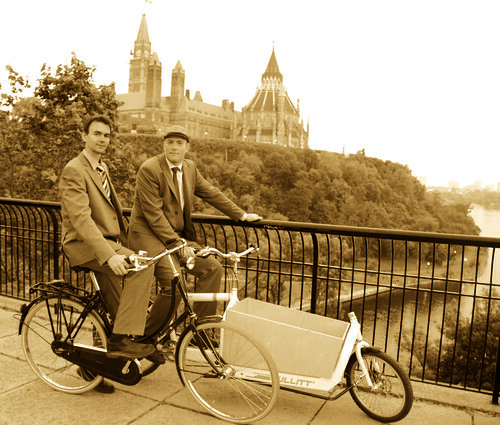 Sepia tones, but that wicked cool Bullitt cargo bike betrays the old school mood. I'm pretty sure I've seen that cargo bike around town, even just a couple days ago. Ottawa might not have a huge cycling scene, but the lack of real hills is nice. Me and my old cruiser do a lot of adventuring. Splendid! Lived there for four years and the great system of parks and trails is the reason I picked up cycling again. Thank you for the tribute. Uh, no cycling scene? Where exactly are you riding?? great to see some cycle chic in the Canadian capital city...hopefully the mentality rubs off on the politicians there and trickles down through mainstream Canadian culture. Eh? Men in ties on bikes are awesome! Wait, what!? Where the hell did he get a Bullitt around Ottawa? I'd go to Ottawa to get a Bullitt, if I knew where to go! Tell me!